June is here and we have had an amazing spell of weather, dare I say that we really need a decent spell of rain. Yet it is such a treat to take so many groups of visitors around the garden in dry, settled weather! If only it would rain from 11pm until 6am three times a week, with no wind….nice soft rain, without the heavy thunder plumps that spoil the opening blooms of the roses. For now, we will enjoy the Mediterranean weather (and try to ignore the biting northerly wind). The roses are on the brink……the rugosas are first to flower with us – Hansa, Sarah van Fleet and rosaraie de l’hay. Penelope will offer a few sweet scented flowers, little and often, from now until October. As for the rest, the show may be brief but it’s well worth the wait. I live in anticipation, as always at this time of year, and can’t quite believe the number of buds on the stalwarts such as Rambling Rector and Blush Noisette. Cerise Bouquet is looking particularly healthy this year although, as always, her new growth looks rather lethal….huge red thorns. Bred by Kordes, she has fantastic disease resistance. I am also rather excited about the moss rose, William Lobb, as he was a rather weak specimen the last few years but he has certainly put on plenty of healthy growth this season. I have planted a few more moss roses this year – Captain John Ingram, Old Pink Moss and Mme Louis Leveque. The lovely alba rose Mme Legras de St Germain looks as though she will romp away as she was only planted last year and is making strong growth already. Post Note: I have fallen asleep twice this week trying to finish this post. I think I may head to Blanket Bay before it happens again, a photo or two to finish. 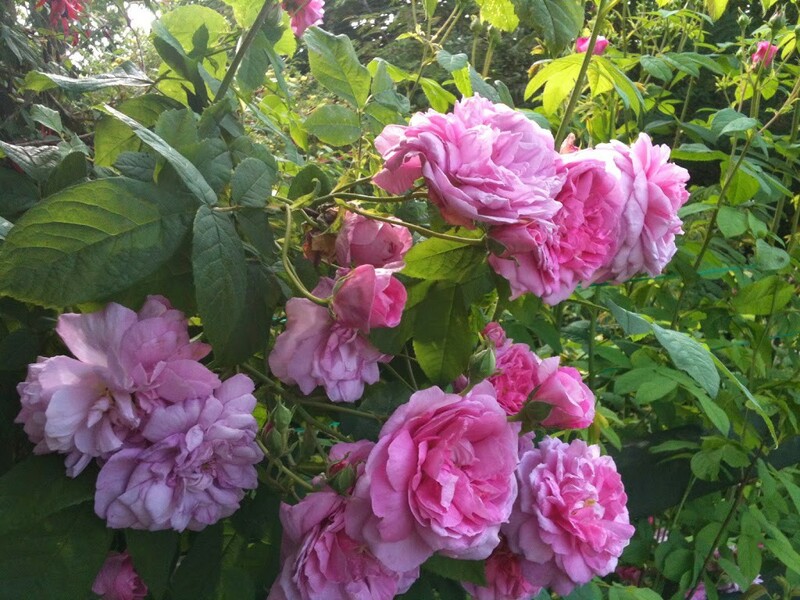 The lovely old damask rose Ispahan.